These products can be used with the Whirlwind Capacitor for R-5760. Need help sizing a pump? Why can't I view prices? This online store is designed exclusively for contractors. You'll need to login or create an account to view prices make purchases. We're your septic system expert and ready to help. Call us at 800-536-5564. 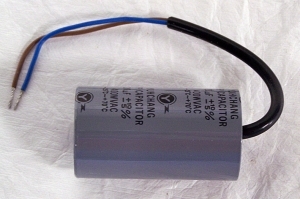 Factory replacement capacitor for R-5760 Whirlwind Ring Blower.